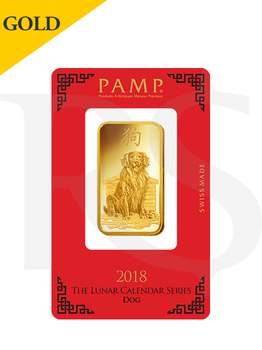 This superb 1 ounce PAMP Suisse Year of the Dog Gold Bar is the latest release in the highly praised PAMP Suisse Lunar Gold Bar series carrying a stunning image of a dog. The renowned PAMP Suisse refinery commemorates the 2018 Year of the Dog by releasing the newest edition of its Gold Lunar series, which carries the superb image of a dog - this year’s Chinese Zodiac symbol. Every year, this world-famous mint strikes a new gold bar which celebrates each lunar character of the Chinese year, emphasizing the different qualities of those who are born in each year. People who were born in 1934, 1946, 1958, 1970, 1982, 1994, 2006, 2018, under the sign of the Dog, are regarded as loyal, smart, friendly, and honest. The other characters of the Chinese Zodiac are the Rat, Ox, Rabbit, Tiger, Snake, Dragon, Horse, Sheep, Rooster, Monkey, and Pig, making this series a splendid gift for any special occasion. Carrying the astonishing craftsmanship of PAMP Suisse, this amazing bar showcasing an eye-catching design is a great addition and a treasured gift for any collector or investor. Contains 1 ounce (31.1 grams) of .9999 fine Gold. Every Gold bar comes in a beautiful red assay card verifying a certified assayer has approved the bar.